2019 Season Tickets have been selling well and we would like to remind fans that the deadline renewal is December 15th to secure your 2018 seat for next season. The deadline to renew your existing seat expires on 15.12.2018 and after this, all seats will be released on general sale. With Declan Devine taking charge for a second spell and 18 home games at the Ryan McBride Brandywell Stadium, it will be an exciting season ahead for the Candystripes in the 2019 Season. The year also marks the 90th anniversary of the club’s first competitive fixture and 70 years since the club picked its first major silverware, when it lifted the IFA Cup in 1949. 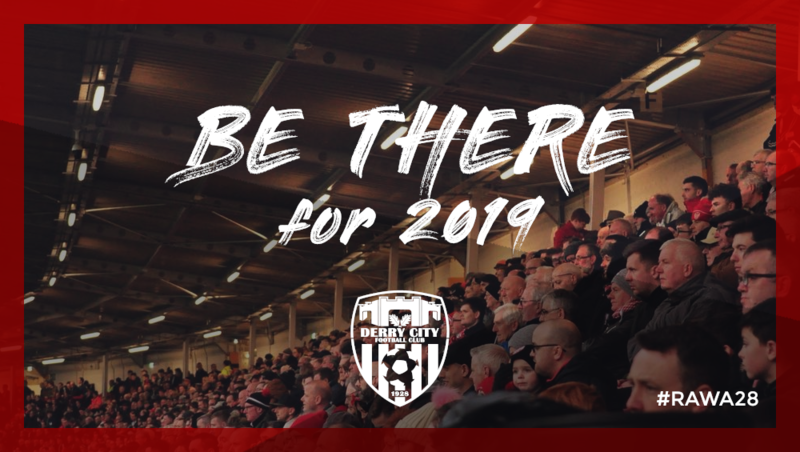 Season tickets guarantee entry to all 2019 SSE Airtricity Premier Division games and provide priority access to all ticket fixtures, such as Irish Daily Mail FAI Cup games. These offer a saving in excess of 10% for adults and concessionary tickets compared to on purchasing on a match by match basis. Encouraging the next generation of fans, children up to the age of 16 can now get a season ticket for less than £4 a game, a saving of over 50% on 2018 prices! Online renewals can be made 24/7 and allow fans the chance to renew without having to visit the office during these times. Season tickets can be made from the Brandywell (renewals and new purchases) and online (renewals only). You will be asked to complete a form with your key information and then you can make a payment, part or full. Renewal deadline to retain your existing seat of 15.12.18. We are renewing our season ticket database and all supporters must complete forms with updated personal information prior to issuance of their season ticket card. A season ticket is the best way to support your club, as it provides vital income for DCFC. At less than £5 a week, it offers excellent value for money and a chance to support and get behind the Red and White Army. Season tickets offer between 10% and 20% saving on match day purchasing. Why have prices changed this year? The small increase of £10 on the 2018 price will help to keep our club at the top end of Irish football. In order to encourage a new generation of supporters, we have extended child pricing to cover all those to the age of 15. Season tickets for anyone under 16 are now up to 50% cheaper than 2018. This allows the new generation of Candystripes to watch for less than £4 per fixture! What are the single match ticket prices for 2019? How can I renew my season ticket? 2018 season ticket holders will have the chance to renew their season tickets online or at The Brandywell up to 15.12.18. Payment can be made by cash, credit card or cheque. If no renewal deposit is made by this date your seat will be released for general sale. Yes, and we would encourage supporters to do so. This means that you can purchase online 24/7 and have your season ticket posted to you. Season tickets and other items can be purchased through our online store! Initially we will be offering only renewals online, and after the renewal deadline, all seats can be purchased online or in store. Yes, Derry City offers 0% interest on installment payments. You can call to the Brandywell and pay installments on your season ticket. Please note that your season ticket will not be provided until all payments are made in full. When will season tickets be available? 2019 season tickets have been on sale since 21.11.2018 from the Brandywell and online. Anyone wishing to purchase a season ticket for the first time, this is only available in the Brandywell, and not online. After the renewals deadline has passed, available seats will be available both from the Brandywell office and online. What happens if I want to move seat? If you want to move seat we recommend that you do not renew your season ticket, and when the seats go on general sale that you review the available seats and pick a new location to watch the action from. After the renewal deadline of 15.12.18 has passed, any seats which has not been secured by way of a minimum £20 deposit will be released for general sale. What are the criteria for Concessionary and Child Tickets? Concessionary tickets are available to adults over the age of 65 and students in full time education at second or third level. Full time education is deemed to be a registered course at an affiliated institution and/or which is more than 16 hours weeks. Children’s season tickets are available to those aged between 5-15 years of age. Please note that proof of eligibility will be required in order to purchase a ticket in one of these categories. In the case of proof of age, please provide an accepted form of identification that includes date of birth (passport, driving licence etc). In the case of full time students, we ask you to provide third party evidence of your current status (stamped letter from education institution, valid student card etc). How do I access the bar in the Mark Farren Stand? We now only offer three types of tickets – Adult, Concessionary and Child. This was a result of supporter feedback from last season. We are currently reviewing the access model for the bar in the Mark Farren Stand and will announce details closer to the start of the 2019 season. I had issues with my seat in 2018, who do I contact? We are aware that a number of supporters experienced issues with their season tickets in 2018. Please email [email protected] with an overview of the issue. We have also implemented a number of process improvements which we hope will reduce the issues noted in 2018.